Black and white negative showing three men dressed up for the Whitby Centennial celebrations. They are standing at Brock and Dundas Streets. 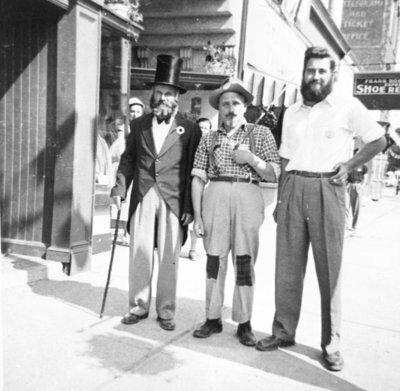 From left to right: Lyman Hess, Charles Stafford, Ivan Davie. Whitby Centennial Celebrations, 1955, unknown photographer, Whitby Archives, 30-012-057.